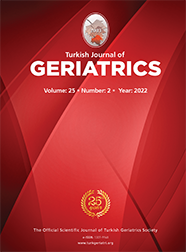 3Ankara Hernia Center, General Surgery, Ankara, Turkey DOI : 10.31086/tjgeri.2018240426 Materials and Method: A retrospective medical record review of geriatric patients aged ?65 years (Group G, n=185) who had undergone outpatient inguinal hernia repair under local infiltration anesthesia (LIA) and sedation was conducted. Their data were compared with those of a group of nongeriatric patients aged 18?64 years (Group C, n=185). Patient selection, anesthetic and surgical care, and discharge criteria were protocol-based. Safety was evaluated in terms of incidence of adverse events, discharge delay, unanticipated admission and readmission and time to discharge. Results: Results for the Groups G and C were age 73.2±7.1 vs. 43.9±12.3 years, number of high-risk patients with American Society of Anesthesiologists classification (ASA) III (n=55 [30%] vs. 5 [3%]), ASA IV (n=4 [2%] vs. 1 [0.5%]), minimal sedation was used in 158 vs. 163 patients, midazolam dose 2.7±1.1 vs. 4.6±1.7 mg, fentanyl dose 63.4±28.6 vs. 88.1±32.4 ?g, lidocaine dose 246.6±59.9 vs. 198.6±69.8 mg, and bupivacaine dose 39±9.5 vs. 47.7±10.7 mg, respectively. Times to discharge were 102±19 min and 91.2±22.5 min in Groups G and C, respectively. Groups were similar regarding the rate of intraoperative and postoperative adverse events, except for ecchymosis (n=2 in Group G vs. n=10 in Group C) and the rates of discharge delay, unanticipated admission, and readmission.